Samsung has been jealously guarding the secrets of the Galaxy Note 9, apart from the 900 or so elements that have already leaked. It can’t always keep a lid on accessories however, and the appearance online of a screen protector seems to bring good news. Hold on to your hats now: the hole for the phone's iris scanner is larger than that found on the Note 8. That should mean that unlocking will be quicker, easier and more reliable. Or it could mean something even better. The next-gen aperture is so large, it might actually be for a dual-function camera/scanner, or even Samsung’s take on the iPhone X‘s 3D camera system. Something along those lines has already been reported as destined for the Galaxy S10. Considering the current push towards sensor engorgement that we are seeing across the smartphone industry, with low-light performance and accuracy a big sell, a super-powered new front-facing iris scanner might not have enough wow factor on its own. Yes, it would improve detection range and accuracy in poor light conditions, which would make sense, but it would make even more sense if it formed part of a 3D camera System, especially as Note 9 is a phone that reportedly has such iPhone X-crushing hardware. 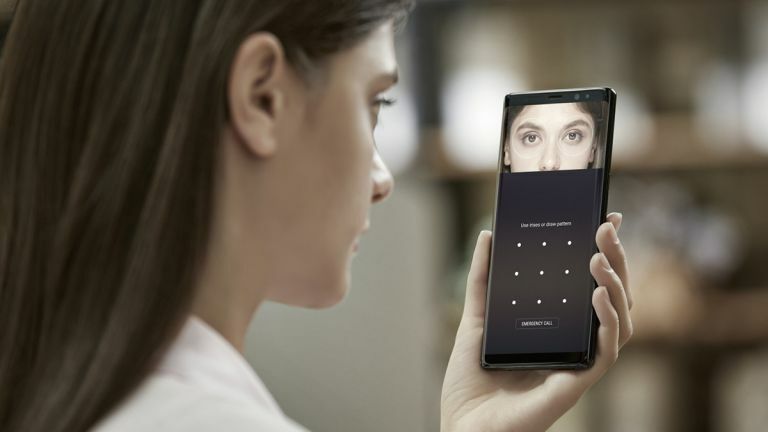 A big improvement in iris scanning tech would also make sense for the Note 9 in light of reports from last year detailing how a large number of Note 8 users suffered issues with the phone's iris scanner. It is also of course possible that Samsung is just swapping the positions of the camera and iris scanner. Donning our pessimistic hats for a moment, if Samsung does NOT have some sort of dual camera/scanner installed in the top bezel, then the Note 9 will actually have NO major design changes from the Note 8, with what looks like an LED indicator, light sensor, and single-lens selfie camera adorning the front of the phone. So that would be dull. We'll have to wait until August in order to find out the truth about Samsung’s double vision. Is the Samsung Galaxy Note 9 going to be available in Teddy Brown?